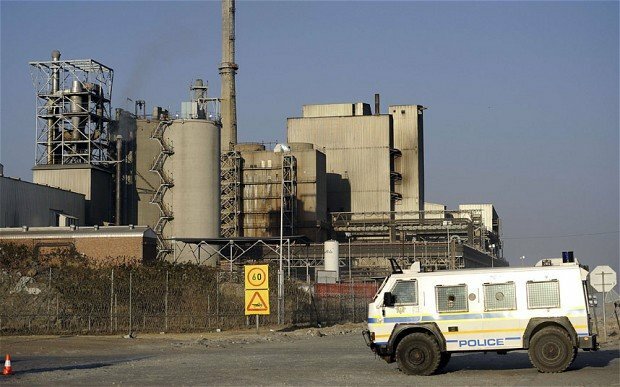 Miners are being intimidated into staying away from work at the South African Lonmin platinum mine where 34 people were recently shot dead by police, the owners say. Lonmin says just 13% of workers have reported for duty on Monday and says miners have been threatened. Hundreds of miners have reportedly gathered outside the mine, amid a heavy police presence. Leaders of the ruling ANC are expected to discuss the deaths. The ANC has been criticized for the way the matter was handled, and President Jacob Zuma is expected to face tough questions at the closed-door meeting. Lonmin, the world’s third largest platinum producer, had hoped that the strike at the Marikana platinum mine would end and production would resume. “Employees are waiting for the environment to be safe. Groups of people are walking around intimidating people who come onto the property,” said Lonmin spokeswoman Sue Vey. The 13% turnout is a sharp drop from the 30% who turned up for work last week and 57% at the weekend. Operations at Lonmin’s mines have virtually ground to a halt since the strike over pay and conditions began earlier this month, causing international platinum prices to jump. Meanwhile, an investigation has opened into allegations that miners were assaulted in police custody, a spokesman for the Independent Police Investigative Directorate has confirmed. Moses Dlamini said that some people said they were beaten with batons and fists in order to implicate their colleagues in the killing of two police officers days before the miners were shot dead. He said that others were allegedly assaulted because they gave statements to those investigating the shooting. He added that the IPID was treating the killing of the 34 miners as murder. President Jacob Zuma is expected to face an uneasy time when he meets the ANC’s National Executive Committee. Many members are said to be livid at the way the matter is being handled. The “Marikana Massacre” – as it has dubbed by the media – has prompted serious questions about the ANC’s ability under Jacob Zuma to improve the lives of poor black South Africans. Jacob Zuma faces a leadership contest this year, and the fact that so many of the killed miners were from the politically significant Eastern Cape Province could play into the hands of his rivals in an increasingly fragmented party, our correspondent adds. In a blow to the president, the party’s largest section in Eastern Cape has just voted for an anti-Zuma candidate as its leader. Jacob Zuma earlier expressed sympathy with some of the grievances expressed by the Marikana miners. He argued the mining sector could afford to increase wages and threatened companies that fail to raise workers’ housing standards with the cancellation of their mining licences. During a recent visit to the mine, Jacob Zuma told workers he “felt their pain” and promised a speedy and thorough investigation of the shootings. The president has also set up a commission to investigate the violence. Police say they opened fire after being threatened by large groups of miners armed with machetes. Ten people, including two police officers and security guards, were killed during the protests – before the police shooting.